Wallace Lawrence "Larry" Amundson was born in Sioux Falls, South Dakota, on December 18, 1927 to Ethel Myers and Lawrence Albert Amundson. He had been a Russellville resident for the past year, living at Stonebridge Assisted Living. 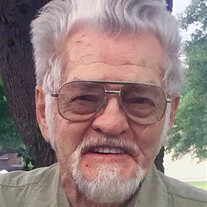 He died peacefully at the Arkansas Hospice River Valley Home in Russellville on June 21, 2018. A World War II Veteran (U.S. Army Airborne), he attended the University of South Dakota, completing fine arts degrees from the University of Maryland. In his long Civil Service career in sports and recreation for the U.S. Army Department of Defense, he was stationed in Maryland, Kentucky, Louisiana and Georgia; as well as nearly 20 years in the Panama Canal Zone and various locations in Germany. He and Lois retired to Sun City in Georgetown, Texas, where they embraced the active senior living lifestyle, continuing their travels. In particular, he liked competitive horseshoes and represented the state of Texas in the Senior Olympics in 2010. He enjoyed many hours of fun and play with The Hawks horseshoe & washers club. His last overseas trip was to visit extended family in Norway. He worked in a variety of art mediums and enjoyed recreational sports, lapidary work, hiking, a variety of clubs, gardening, history and archaeology. He was proceeded in death by his parents and an infant brother. He is survived by his devoted wife of 65 years, Mary Lois Tolj Amundson; one sister, Carolyn Amundson of Staunton VA; daughters Carol Amundson Lee (John) of Russellville; and Suzanne Fuller (Greg) of Topock, AZ; and grandchildren, Alyson McAvoy (Lance), Amber Imhoff (Josh), Jennifer Rose (Scott), Melissa Slone (Travis), Michael Lee and Kyler Lee (Abbey) and Theresa Johnson (Kent); along with 17 great- grandchildren and one more on the way. Cremation arrangements were directed through Humphrey Funeral Service. A private family memorial & burial of cremains will take place at a later time. Internet obituary and online guestbook are available at www.humphreyfuneral.com.